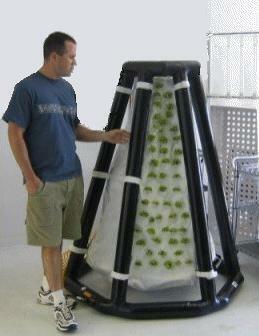 Aeroponics is a slight alteration of the traditional hydroponic system. Aeroponics gets its name because the nutrient solution is mixed with the air (“aero”) using misters or foggers to atomized the nutrient-rich water solution. Aeroponic systems simply uses a mist, or fog, to keep the root systems moist with the nutrient solution by spraying the plant’s dangling roots and lower stem with the atomized nutrient-rich water solution. 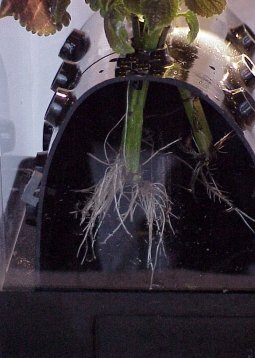 These roots are generally housed in a closed or semi-closed growing chamber. Aeroponic growing is considered to be safe and ecologically friendly for producing natural, healthy plants and crops. A true aeroponic system doesn’t use any soil or liquid medium, just a fine nutritious mist sprayed over roots suspended in a sealed chamber. It also provides plant support in such a way that the physical contact is minimized between the plant and support structure so that it doesen’t hinder the natural growth, or root expansion of the plants. Allowing for 100% of the plant to be entirely in the air and growing in unhenderd disease-free conditions. Long-term aeroponic cultivation requires the root systems to be free of constraints surrounding the stem and root systems. Aeroponics systems use less water than a regular hydroponic systems does. This makes it an attractive growing method to commercial producers because it uses less resources to produce the same amount of product. Because the nutrients and water are combined with the atmosphere in the growing chamber, there is no need for large amounts of nutrient selution to keep the root systems from drying out. Commercial aeroponic systems generally uses one-tenth of the water otherwise necessary to grow the crop, but this can sometimes be reduced to as little as one-twentieth. Aeroponic systems are much better at contributing to more effective oxygenation of the root systems. Oxygen/air intake is very important to growing healthy plants. Both the mist or fog allows the root systems to grow a lot of fine hair like extensions on the roots because of the small particle sizes of the water droplets. This significantly increases the surface area of the root system, and allows the roots to uptake both the nutrients and oxygen/air more efficiently than they would in a typical hydroponic system. This factor also allows the plants to grow faster than they would in a typical hydroponic system (assuming all the other growing conditions remained the same). Aeroponics also provides a sterile environment for the root systems. When previously, clippings of stubborn plants such as cacti, and hardwoods were difficult to grow into full plants due to susceptibility to soil or water-borne bacteria, necessitating the use of seeds. Aeroponics provided the bacteria-free environment these clippings need to grow to maturity. If a plant does somehow become diseased, it can be easily and quickly be removed without leaving residual bacteria in the growing medium. Other plants like strawberry’s that are prone to pathogens and bacteria in soil, can be grown in aeroponic systems where they wont be subjected to these pathogens or bacteria. Typically Strawberry’s are grown from bare root plants that were grown from the runners of mature strawberry plants. These runners are grown in soil where they can acquire these pathogens and bacteria that attach to the roots. Then the roots are washed off and the plant is put in cold storage to be shipped to the grower. The pathogens and bacteria still infect the roots where they can be transferred into the hydroponic systems of the grower. Aeroponiclly grown plants wont be able to transfer anything into the system, simply because they were never exposed to them in the first place. That’s a huge benefit for commercial growers. Another benefit in using Aeroponics as the growing method is, there is no soil or growing medium involved. And when grown inside greenhouses with no need for pesticides, there is none to wash to off. With no soil or pesticides to wash off, small herbs that would normally be damaged by washing (like chives, parsley, cilantro etc.) remain in pristine condition all the way to the table. This is an attractive benefit to restaurants who like to use fresh herbs in their dishes, where presentation is important. Even NASA is using aeroponic technology for space exploration. Together with Aeroponics International, NASA is developing a self-contained, self-supporting, flexible low-mass aeroponics crop production unit. These inflatable aeroponic systems were designed for space-based applications, and collapse into a small area for lightweight, easy transportation into space. These units are ideal for growing food in space or other extraterrestrial environments, such as the international space station, Moon and Mars. When the first Moon base is scheduled to be set up around 2020, NASA will likely make use of aeroponics, removing the need to transport large amounts of soil and water for agriculture that would otherwise be needed to sustain the human researchers that will man these stations.